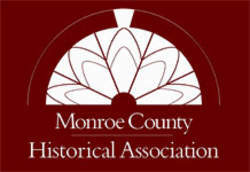 The Monroe County Historical Association is headquartered in the historic 1795 Stroud Mansion and features a museum highlighting Monroe County history and a genealogical/research library on Monroe County families. This non-profit community organization is dedicated to preserving the history of our corner of Northeastern Pennsylvania. The rooms of the Stroud Mansion are filled with exhibits and local artifacts of times gone by. Each year a new exhibit of a specific interest is displayed on the first floor.